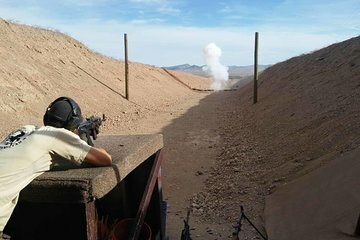 Escape the city to fire a variety of guns at a military-style outdoor range in Arizona's Mohave Desert. Choose from a morning or afternoon departure with hotel pickup and drop-off (select Las Vegas properties) and lunch included. Make a photo stop at the Hoover Dam before arriving at the shooting range. Opt to add on a Grand Canyon helicopter tour and Lake Mead National Park ATV tour, if you like. Head into the Nevada desert on a trip that features the Hoover Dam, shooting range access, and bonus upgrades. Had an absolutely great day which surpassed expectations. Many thanks. Richtig Spaß! Mittagessen sehr geile Burger!